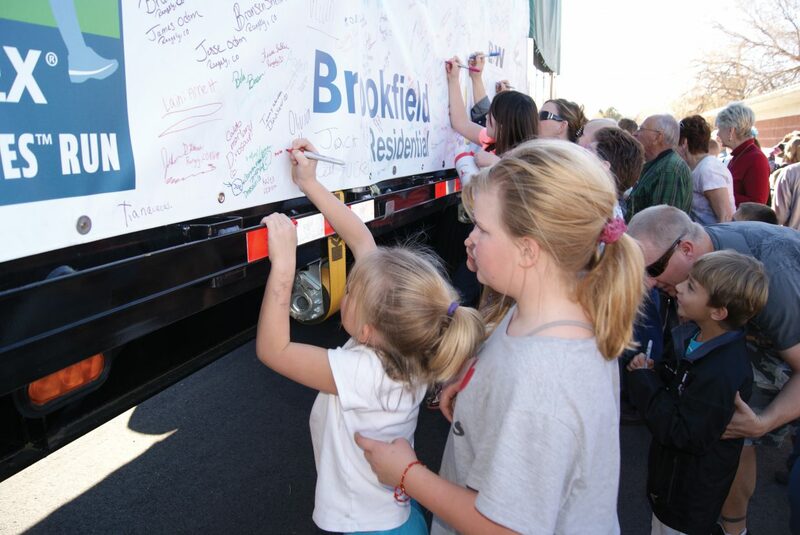 Craig elementary students take turns signing the tarp protecting the Capitol Christmas Tree Tuesday afternoon at the Moffat County Fair Grounds. The tree stopped in Craig on it's way from Meeker — near where it was harvested — to Washington, D.C.
Craig elementary students take turns signing the tarp protecting the Capitol Christmas Tree Tuesday afternoon at the Moffat County Fair Grounds. The tree stopped in Craig on it’s way from Meeker — near where it was harvested — to Washington, D.C.
Craig elementary students squirmed in anticipation Tuesday afternoon as they waited for the Capitol Christmas Tree to make its stop in Craig. A crowd of several hundred people came to see the tree at the Moffat County Fairgrounds as it made its way from Rangely to Steamboat Springs on its way to Washington, D.C. The Capitol Christmas Tree was selected to come from Colorado this year, and was cut down in Meeker. Running a little late, kids were kept busy singing along to Christmas carols, especially enjoying the Alvin and the Chipmunk’s renditions of Christmas favorites. Once it arrived, the 74-foot tree took some maneuvering to get close to students, but once it did, students were allowed to sign the tarp covering the tree, as were other Craig residents. “I hope we can all celebrate the Christmas season as a unified country, the United States of America,” Carwile said. Stacey Mathers sang Christmas Carols and Santa and “Mrs. Clause” handed out candy canes to kids as part of the festivities. Virginia Parfrey was there to see the tree, and said she went because it was a Colorado tree. She wasn’t alone in that opinion. “I think it gives kids a sense of civics and government and an appreciation for the affect we have on society,” said third grade student-teacher, Angelia Simpson. Steve Martinson, the art teacher for Ridgeview and Sunset elementary schools, coordinated and helped students make at least 1,000 of the ornaments that adorn the Capitol Christmas Tree. He said although it was short notice, it was great it was able to stop and let the kids see it.